Our children need safe drinking water — especially at school where they go to learn and play each day. Unfortunately, lead is contaminating drinking water at schools and preschools across the country. 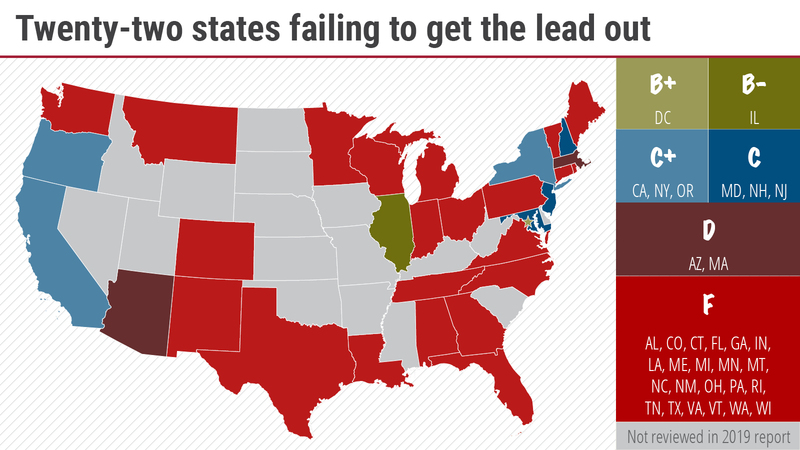 As our report shows, states are failing to make the grade when it comes to keeping lead out of drinking water at school. 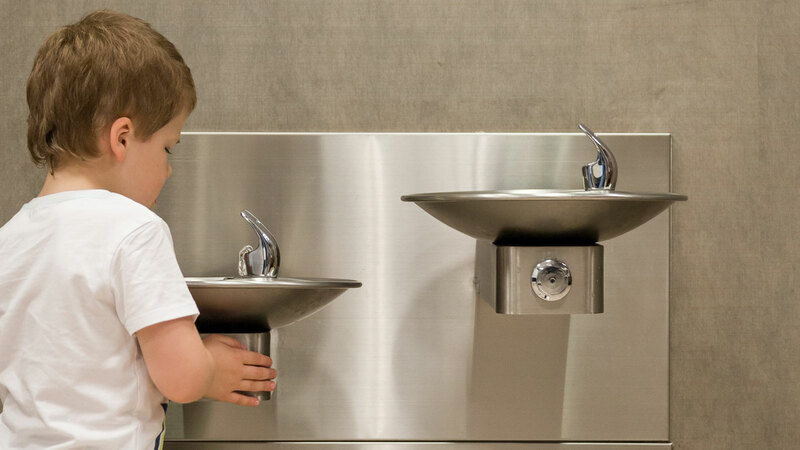 Instead of waiting for more testing, we need to proactively replace the fountains, faucets and other lead-bearing parts at the root of this toxic hazard for our children. Several states have no requirements for schools and pre-schools to address the threat of lead in drinking water. Over the past five years, the tragedy of Flint, Michigan, has stunned the nation. We watched the drinking water of an entire city become contaminated with lead. And, we know now that this toxic threat extends well beyond Flint to communities across the country. In fact, test results now show that lead is even contaminating drinking water in schools and preschools — flowing from thousands of fountains and faucets where our kids drink water every day. The health threat of lead in schools’ water deserves immediate attention from state and local policymakers for two reasons. First, lead is highly toxic and especially damaging to children — impairing how they learn, grow, and behave. So, we ought to be particularly vigilant against this health threat at schools and preschools, where our children spend their days learning and playing. Second, current regulations are too weak to protect our children from lead-laden water at school. Given the high toxicity of lead to children, the most health-protective policy is simply to “get the lead out” of our schools and preschools. This involves proactively removing lead-bearing parts from schools’ drinking water systems — from service lines to faucets and fixtures. Because this prevention work will take time, schools can start by proactively installing filters certified to remove lead at every tap used for drinking or cooking. Schools should also immediately begin regular and proper testing of all water outlets used for drinking or cooking to ensure that the prevention steps being taken are effective, and promptly remove from service any outlets where lead is detected. And, schools should provide the public with easy access to all testing data and the status of remediation plans. Lead is a potent neurotoxin, affecting the way our kids learn and behave. There is no safe level of lead for children. The science now makes clear that there is no safe level of lead exposure for our children. So, to ensure safe drinking water for our children, we need policies that are strong enough to “get the lead out” at schools and preschools. Proactively “get the lead out” of schools and child care centers by replacing fountains, faucets and other parts containing lead. Install and maintain filters certified to remove lead on every faucet or fountain used for cooking and drinking. Adopt a 1 part per billion (ppb) standard for lead in schools’ drinking water, consistent with recommendations of the American Academy of Pediatrics. Require testing at all water outlets used for drinking or cooking at all schools annually, using protocols designed to capture worst-case lead exposure for children. Immediately remove from service any faucet or fountain used for drinking or cooking where testing indicates lead in the water. Disclose all available information about lead in water infrastructure, test results and remediation plans/progress both onsite and online. Provide funding to remove lead in schools’ water infrastructure. Enforce and strengthen federal rules to protect drinking water from lead — e.g. the Lead and Copper Rule. Provide major funding to help states and communities remove lead in water infrastructure — including lead service lines and plumbing/fixtures in schools. Marshal the authority of all relevant federal agencies to protect public health from contamination of drinking water. And of course, we should fully protect all sources of drinking water from pollution. Contact your school and ask whether it has lead pipes or plumbing. Ask if the water has been tested for lead and to see all the results. Sometimes schools only report levels of lead in water above 15 parts per billion. But there is no safe level of lead in drinking water — especially for our children. In addition, we’re calling on all states to “get the lead out” of schools' drinking water. Please urge your governor to take strong action to protect our children’s health.